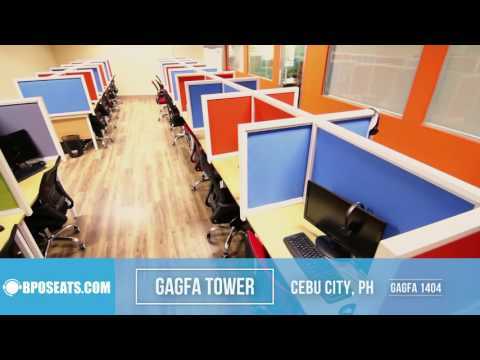 Over four years old, and with over 7500 available seats, spread across six different locations, BPOseats.com has positioned itself to be the #1 BPO Solution, Call Center Office, Serviced Office and Seat Leasing option in Cebu, Philippines by providing our clients with the most highly experienced, dedicated employees coupled with our brand new PEZA accredited facilities that use only the fastest 100mbps+ FIBER OPTIC Internet Connections available at the most affordable prices around. Primary seat-leasing-venues, we’re proud to say all our facilities are brand new and highly professional. We use only the newest technology, highest quality equipment and office materials in all our business solutions. We Feature EXCLUSIVE Seat Leasing and Call Center Office, not “shared” environments. What sets us apart from the market is a model that decides to create individualized exclusive spaces for each of our Clients – from 6 seats to 1000, we create unique offices that you can operate privately inside, without being on a “shared” floor with other campaigns or businesses. So whether you’re seat-leasing, or asking us to run your campaign, rest assured you will have the post professional exclusive environment for your business to thrive! BPOseats.com employees all have years of experience covering the spectrum of all major business industries and continually strive and provide our clients with the most professional, catered solutions to meet and exceed the standards and company culture of all our clients. Whether it be running a large Call Center campaign, setting up a custom serviced office or simply renting office, seat leasing, or a call center office BPOseats.com has many flexible options and will always deliver the best services available with the absolute best pricing in the Philippines. That is our mission statement. We personally guarantee it will be worth your time to contact us and discuss your needs. Our pricing is the most competitive option in Cebu. If you’re looking to setup a Cebu call center office or Cebu seat leasing, you need to be working with BPOSeats.com! We're transitioning to this office. Best location in Cebu, its literally ABOVE Ayala. Accessible location, great people to work with, also best facilities, and super fast internet connection. EXCLUSIVE: Our offices are 24/7 Dedicated Access. We don't do 'shared' environments because it doesn't work! Our pricing is for 24/7/365 - no additional charges, no surprises. SHARED: Our competitors do giant shared floors - its loud, its crowded, its weird. You'll be kicked off your CPUs when your shift is up. Not fun! Other campaigns using your CPUs during off-shift. Try reaching out to our competitors. After you exhaust yourself dealing with their "entry-level" sales-staff that doesn't know anything you'll realize our BPO competitors can't even do a proper job of BPO'ing their own business...what are they going to do with yours? Amenities: Internet Speed - 100mbps Dual Fiber, Internet Provider - RISE, etc. Description: Situated at a primary section of Cebu City's northern district, eBloc Tower 4 at Cebu IT Park is the address of choice for multinationals and industry leaders open to prime residential, business and commercial spaces of mixed-use hub. Its roads connect to major arteries that lead to the Mactan International Airport and the Cebu International Port. It is near shopping centers, residential subdivisions, hotels, learning institutions, golf courses, dining and entertainment options. Amenities: Internet Speed - 150mbps Dual Fiber, Internet Provider - RISE, Globe, etc. Amenities: Internet Speed - 200mbps Dual Fiber, Internet Provider - RISE, etc. Description: With 2200+ sqm facility and situated at a primary section of Cebu City's northern district, i1 Building at Cebu IT Park is the address of choice for multinationals and industry leaders open to prime residential, business and commercial spaces of mixed-use hub. Its roads connect to major arteries that lead to the Mactan International Airport and the Cebu International Port. It is near shopping centers, residential subdivisions, hotels, learning institutions, golf courses, dining and entertainment options. Description: Brand new 2000 square-meter floor plan, situated between the biggest call centers in the Philippines - this location is sure to impress your staff as well as clients. With brand new furnishings (PCs, office chairs, and commercial aircons) this is our newest seat-leasing location for BPO Seats. 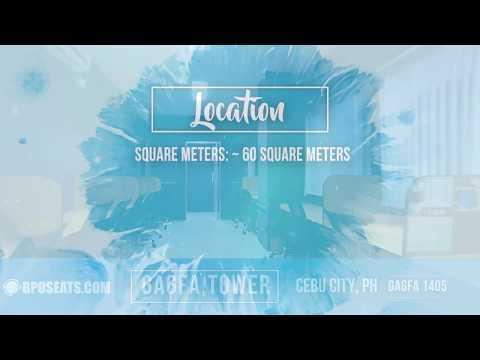 GAGFA is a PEZA-accredited facility, and since this facility launched June, 2016, there is flexibility to build out custom-layouts and configurations to match any Client's needs. Description: MarQuee Mall captures the festive spirit of the local culture while providing the trademark concepts and services of the Ayala Malls, making it one of the favorite gathering places in Central Luzon. BPOseats.com has positioned itself to be the #1 BPO Solution, Call Center Office, Serviced Office and Seat Leasing option in Cebu, Philippines by providing our clients with the most highly experienced, dedicated employees coupled with our brand new PEZA accredited facilities that use only the fastest 100mbps+ FIBER OPTIC Internet Connections available at the most affordable prices around. All our facilities are brand new and highly professional. We use only the newest technology, highest quality equipment and office materials in all our business solutions. Management and operational team leaders with decades of experience in the BPO industry to head any project successfully. ONLY 1 MONTH SECURITY DEPOSIT TO START OPERATIONS.